If I need to describe this property I must say that this is one of the best experiences I have ever had with hotels. We travel a lot with my family, we stay in different places but in Attalos everything is so great. It is extremely clean, awesome location/ just 5-7 min walk till beach, outstanding people who really care about you and your stay, very supportive hotel owner, kitchen equipment- all what you need. Our room got cleaned every single day. Well, i can just continue. And I must admit that hotel owner has a restaurant by the beach named Bravo. Food was very tasty, and service extremely caring. The terrace was brilliant. It was sunny all day long and was at the very top of the apartment building so we were not disturbed at all. It was very quiet there which was great for us. The professional and friendly ambiance and the owners. Specially the service here and in Bravo restaurant. Fresh food and best service. Thank you! Wonderful house with very friendly owner! Thank you so much! The room was beautiful. We had an enormous roof terrace which was totally unexpected. We are definitely coming back but to stay for longer next time. My second year staying with Antoni's and Dora. I cannot recommended the accommodation highly enough for friendliness cleanliness. The breakfasts are Great. The rooms modern ect. I really don't want to leave the friend I have made here. If you are travelling to Crete. Do yourself a favor. Book your stay with the Attalos Agia Pelagia. You can thank me later. Happy out!. We arrived at 10:00 and promptly got a key, because the room was already prepared. Apartment was very clean. The chambermaid every day made our bed, more than twice a week changed towels and changed also bed sheet - awesome! Breakfast was everyday the same - egg, bacon, toast, jam, chocolate, butter, 2-3 types of bread, crossaints, buns, coffee, fresh orange juice (delicious), jogurt and fruit. It is not buffet breakfast, but we could eat everyday the same. Owners were very friendly and they helped us with everything we needed. We always found parking space in the front of the apartment. It is close to the "centre" and the beach. On the check-out day we could stay in our apartment and had the last great time at the swimming pool. Lock in a great price for Attalos Apartments – rated 9.5 by recent guests! 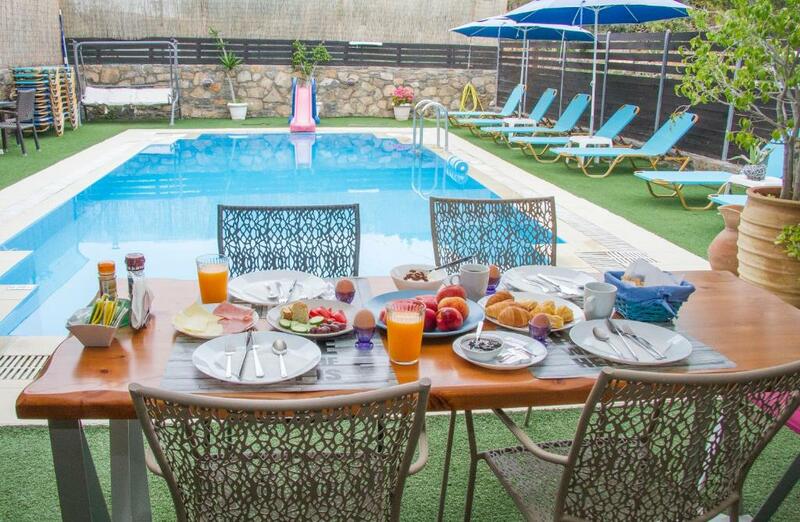 Featuring an outdoor pool with sun loungers, Attalos features self-catered accommodations with a balcony and free WiFi. The beach of Agia Pelagia with bars and restaurants is only 1,000 feet away. 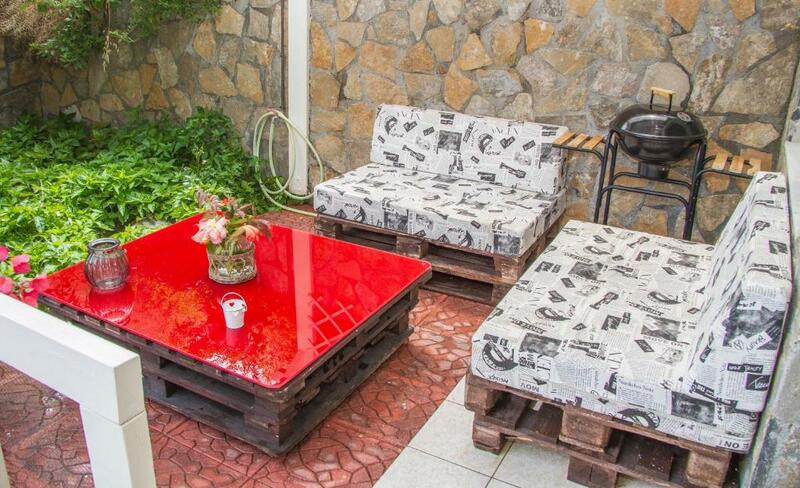 Simply yet tastefully decorated, all studios and apartments are spacious and air-conditioned. Each has a kitchen with a mini fridge and oven with hobs. A flat-screen TV, wardrobe and desk with mirror are included. Staff at Attalos Apartments can arrange car rental to visit the city of Heraklion, at 11 mi. Nikos Kazantzakis International Airport is at 12 mi, while the seaside village of Fodele and its sandy beach are 6.2 mi away. Free public parking is possible nearby. 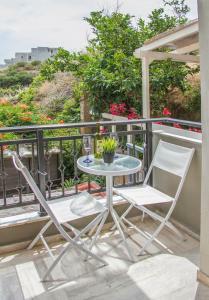 뀐 Located in the top-rated area in Agia Pelagia, this property has an excellent location score of 9.0! When would you like to stay at Attalos Apartments? This apartment features air conditioning, kitchen and balcony. Is has a double bed in the bedroom and a single bed in the kitchen area. This room in located on the ground floor and is specially designed for people with mobility issues. This triple room features a patio, private entrance and air conditioning. There are 2 single beds joined in one big double bed with no gap in between them and a single bed all in the same open space room. This family room offers a fully-equipped kitchen with an oven, a spacious refrigerator and access to a furnished veranda. 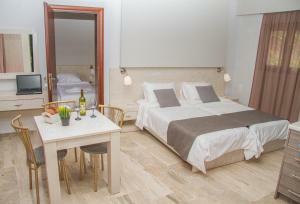 we are a small aparthotel just 8 minutes from the beach. There is no seaview since we are not in the mountain but we manage to make everyone feel at home and we think that we have achieved that since we have more and more repeaters every year. We are open, friendly people trying our best to make our guests feel at home and helping them with any suggestions or information they might need. Guests love the fact that it is such a quiet place with easy access to the beach (0.500km) . Ideal not only for families but also for those who want a clean ,cosy place to use as a base ,prepare their meals and plan their excursions for the next day to most sights that Crete, this magnificent island , is so popular for !!! It is close to the beach but also far enough from the noise at a quiet neighbourhood. We are just 20 metres from the main street which is very convenient for those who want to be close to Iraklion airport(17km). or use as a base to travel around the island..
House Rules Attalos Apartments takes special requests – add in the next step! Attalos Apartments accepts these cards and reserves the right to temporarily hold an amount prior to arrival. Please inform Attalos Apartments of your expected arrival time in advance. You can use the Special Requests box when booking, or contact the property directly using the contact details in your confirmation. Cannot think of anything! All was just fine. Lovely accommodation close to Heraklion airport (less than 30min drive) which I totally recommend to those who wish to have a convenient stay at the beginning or end of a self-organized tour in Crete. This was my case, I wanted to be close to the airport, but not in a city center and found A. Pelagia to be an absolute charming spot to spend 3 nights before flying back home. I could even imagine spending a week relaxation here (ideal if you are not planning to drive), as there is everything walking distance to have an enjoyable stay (many restaurants/bars, shops and all the tourist facilities). Now the appartment itself was really beyond my expectations: modern design, super well maintained and clean - comfortable bed, hot shower and very good wifi. The little terrace with the red low table is a delight to have a drink/snack or just go and sit around the pool :D I checked the kitchen appliances which seemed fine for a longer stay, but did not use it (too many good restaurants nearby ha ha!). Mid-october it was super calm around the Attalos apartments, however the beach only 5 minutes walking distance was busy enough to make it enjoyable (not crowded, just fine!). Antonis also owns the Bravo restaurant, which you should definitely visit during your stay! Thank you Antonis for welcoming me :) It was exactly what I was expecting for the end of my vacation in Crete this year! Having to climb three sets of stairs was the downside to have a rooftop terrace but it kept us fit. The property was extremely well located. The owners are super friendly. They welcomed us at 1am as our plane was landing late and we had a fantastic breakfast on our first morning. The room was very comfortable and we loved our little terrasse. We hope to be back again! !